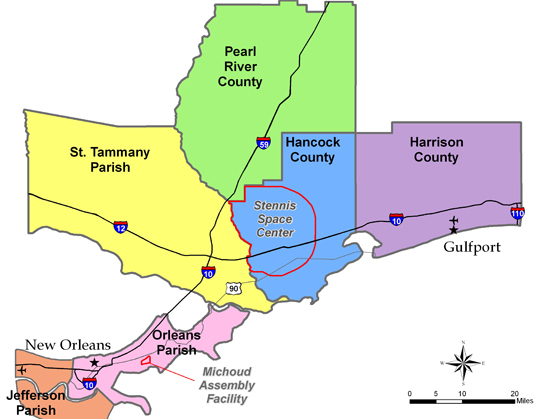 The John C. Stennis Space Center (Stennis is located on the Mississippi Gulf Coast on Interstate 10 at Exit 2, approximately 35 miles west of Gulfport, Mississippi, and 45 miles east of New Orleans, Louisiana. This map gives driving directions to NDBC's Administrative Building 3205, Mission Control Center Building 3203, Engineering & Logistical Facility Building 3202. Directions from Louis Armstrong New Orleans International Airport (MSY) click here. Directions from Gulfport-Biloxi International Airport (GPT) click here. Federal employees and contractors may use their Federal Common Access Card (CAC) for admittance to the Center under the current security setting. 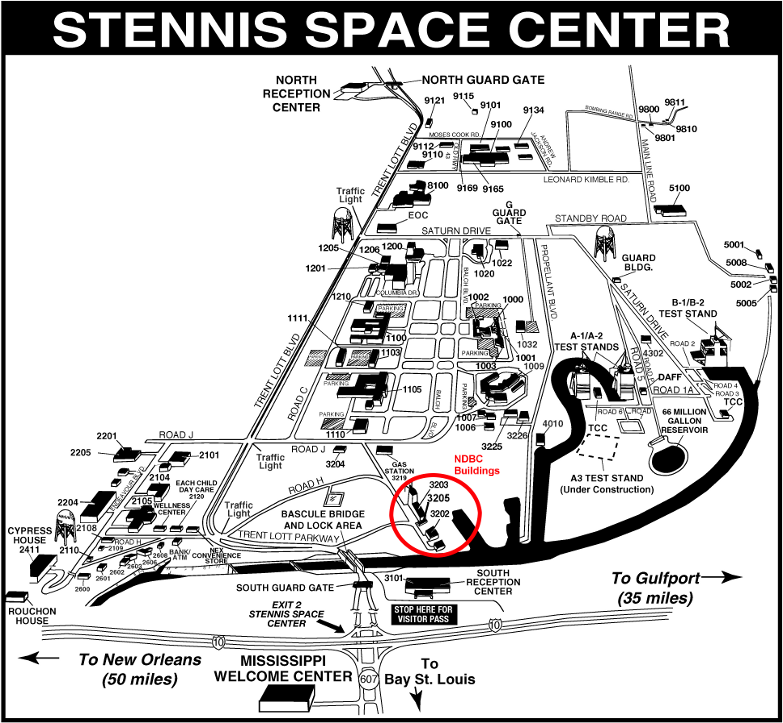 Anyone without a CAC wishing to visit NDBC at Stennis must have a visitor badge issued upon arrival. Visitors should contact their NDBC sponsor and establish an arrival date and time so their names can be put on the list for Stennis admittance. Visitors must have a valid photo ID to receive visitor badges. Foreign nationals must have their passports in addition to advance approval. Please note that visits to NDBC and Stennis by foreign nationals require special advance arrangements, which can take up to 60 days to complete. Stennis has two reception centers: one at the South Gate (located at the Interstate 10 entrance) and one at the North Gate (located off Interstate 59 at Highway 607). Allow at least 30 minutes for visitor badge issue. Lines for badge issue may become long, depending on the time of day. There are five NOAA entities at Stennis Space Center. Click here for more information. Stennis has a visitor center, StenniSphere, which has tours available for individuals or groups. Be sure to visit the NOAA Science on a Sphere!